An ancient symbol of knowledge gains computer hardware guts, becoming art in the process. An ancient symbol of knowledge, this beautiful wooden apple's insides are made from the tiny but potent computer components that send information around the world. Are we smarter now? We don't know, but we know what we like when we see it. 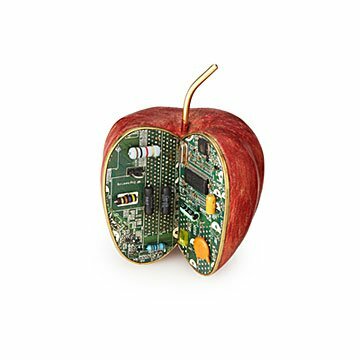 This natural-plus-technological fruit, Carmi Y. Plaut's artistic use of computer parts that otherwise would have ended up in a landfill—we like. Made of sustainably sourced wood and recycled computer parts in the Philippines. “Upcycling isn't a trend," says Chicago designer Carmi Y. Plaut, “it's a way to take the unused trash of the world and make it into something beautiful.” Turning abundant e-waste into art is a passion for him. He likes to say, “Our motherboards are friends with Mother Nature.” Creative design thinking comes easily to Carmi, who has over 20 years of experience doing it. His designs and products sit in homes, museums and collections throughout the planet. If you know someone who loves Apple products, this is a great gift for them. Well made piece of art. Will look great on desk. Great conversation starter. I bought this for my son's birthday because he is an engineer and works with circuit panels. After I received it I bought another gift for him. The apple is cute and different but it is too little and definitely not worth the price. It does not come in a gift box either. Really love the uniqueness of the product. Someone one saw my apple and wanted to buy it. Great conversation piece. This is a gift for a coworker leaving to work at Apple! It is small and inexpensive but clever and beautifully made. This is something that they can take with them as a memento and know they are missed. This was a gift for my husband. He works in IT and is a die hard Apple computer guy, so this was perfect. Very well made. Paint job on the Apple was beautiful. Purchased this for nephews high school graduation in June. He will major in Computer Science. He loves anything Apple brand, so this combination is perfect! I didn't expect a real sized apple which looks realistic. Very well crafted and the perfect gift. I couldn't ask for a better gift.